The Department of Otorhinolaryngology was founded in 1956, the same year that the hospital started its operations. It was established at the onset as a separate department unlike other institutions where the Department of ENT usually evolved from a Department of EENT. An interesting historical side light is that it was also during this time that the final draft of the constitution and by-laws of the future Philippine Society of Otorhinolaryngology—Head and Neck Surgery was completed. The Department started its residency training program in January of 1993 and gained accreditation for 4 years in 1996. Since then, it has consistently been granted accreditation by the Philippine Board of Otolaryngology Head and Neck Surgery. From its humble beginnings, the department now prides itself with competent consultant and resident staff including its graduates. It is one of the training hospitals well equipped in the fields of Otology, Neuro-Otology and Laryngology. 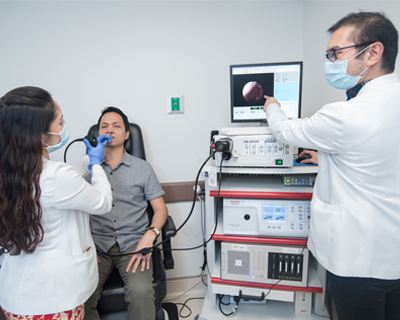 It was also the first department to integrate hearing evaluation tools and hearing aid fitting in the residency training program. In cooperation with the Metrobank Foundation, the department continues to conduct an annual surgical mission on cleft lip and palate deformities, known as Project “Bridging the Gap.” For this, the hospital has been awarded by the Asian Hospital Management Awards (AHMA) in 2009 and the 45th Anvil Award in 2010.